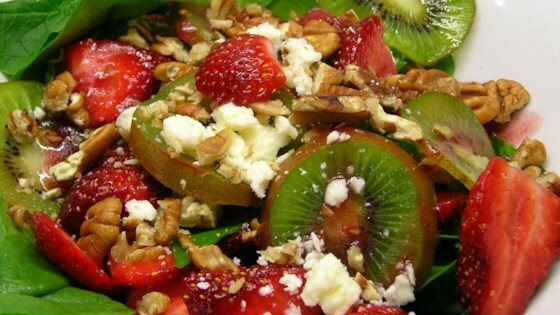 "My aunt makes this salad for my family and I every time we visit." Well - either I blew it, or we are just not raspberry spinich folks. I threw most of it away. I thought it was alittle too oily for us. Great salad. It's definitely worth the effort to make the dressing. Like others, I added blue cheese, a nice touch. Good recipe. I used a bottled raspberry vinegarette. Definiately toast the walnuts. Looked pretty. Next time, I will probably add some blue cheese crumbles. A delicious blend of raspberries and strawberries. I used fresh frozen raspberries to make the raspberry vinigar and tossed a few into the salad. A great ladies salad!!! I used bottled raspberry dressing instead of making the one in the recipe. I received many compliments on this salad. It is a nice combination of ingredients.